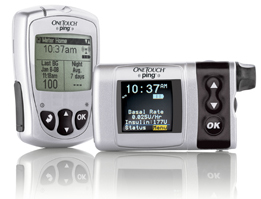 The OneTouch Ping is the newest insulin pump from the Animas Corporation. It is a glucose management system that includes an insulin pump and a glucose meter-remote. The two devices communicate wirelessly with each other. Users can calculate insulin doses and deliver boluses through the glucose meter-remote or manually on the pump. OneTouch Ping is a collaborative effort between two of the companies in Johnson & Johnson’s Diabetes Care Group: Animas, which manufactures insulin pumps, and LifeScan, which makes the OneTouch brand of glucose meters and test strips. What are the pump’s features? You can upgrade your old Animas pump to a Ping through their ezAccess Program. You pay different prices depending on which old pump you have. Extra device compared to Deltec, but Deltec system is larger. This is a slick system for pump wearers who want to give boluses remotely and discreetly. 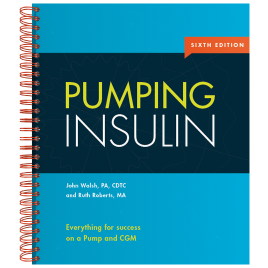 It brings pump wearers closer to insuring that all boluses are read into pump data. See information for the older Animas pumps.